screening of blood donors and diagnosing patients related to infection with Treponema Pallidum. negative control or positive control to the respective wells. Gently vibrating the plate. water-bath or microplate incubator at 37℃ for 60 minutes. 5. Add Conjugate: Add 100µL of conjugate to each well (except the blank well). 6. Incubate: Cover the Microplate and incubate the plate at 37℃ for 30 minutes. 7. Wash the Plate: Repeat the wash procedure as in step 4. 8. Add Substrate: Add 50µL of Substrate Solution A and 50µL of Substrate Solution B to each well, mix well. Cover and incubate at 37℃ for 10 minutes. 9. Stop reaction: Add 50µL Stop Solution to each well, mix well. mean OD value of positive controls must be greater than or equal to 0.8. Important: If the NC is lower than 0.05, take it as 0.05. 3. 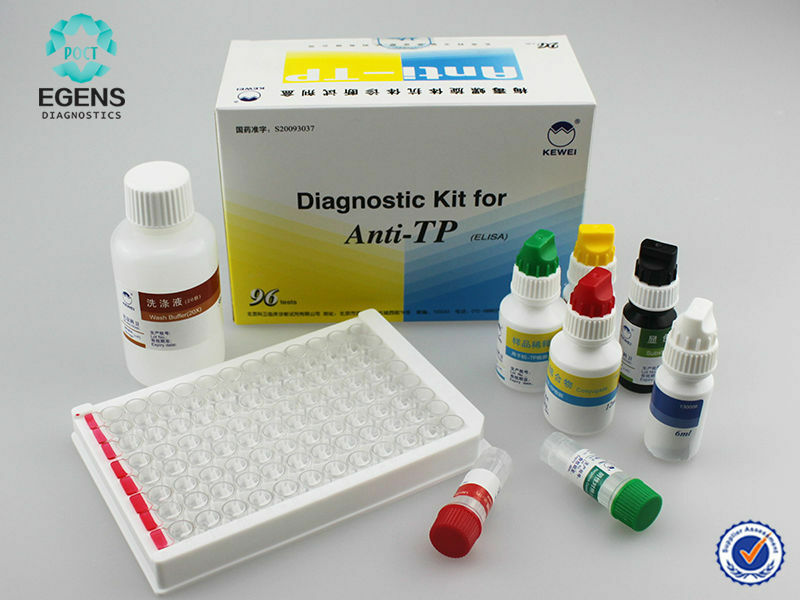 OD value of the sample ≥ cut off value, it is positive for anti-TP. OD value of the sample < cut off value, it is negative for anti-TP.